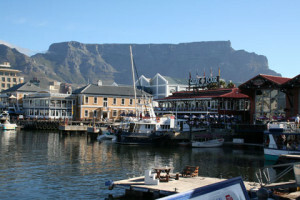 The V&A Waterfront is a tourist hotspot, high on the must-visit list of visitors into the city, but it has its fair share of locals who live and work in the area or use the facilities en route to the Atlantic Seaboard from the city. The marina and lavish apartments that dot the waterways created along the Waterfront are the way Cape Town should be enjoyed. With Table Mountain as your backdrop, the sea and water immediately accessible, a buzzing nightlife outside your door and easy access to the city bowl, there are few places to stay that beat the appeal of the Waterfront. The visual feast of creative modern architecture combined with the restoration of historically significant buildings of the still working harbour and its surrounds, has made for an eclectic burst of energy on the city bowl’s front stoep. The SA Maritime Museum, the Clock Tower, the Time Ball Tower and the Dragon Tree stand in the midst of restaurants, coffee shops and the new Nelson Mandela Gateway. Trips to Robben Island leave from here, and the Two Oceans Aquarium and Telkom Exploratorium – the magic of telecommunications through hands-on exhibits – make for interesting forays.